A family in Warren is grieving the loss of six important family members; their four dogs and two cats, all rescued from area shelters. The animals died in a house fire Thursday morning on Topfer Road near East 9 Mile. “Every spot of this property has memory of them," said David Behm, the home owner. When the fire broke out, Michelle Behm could only think of dogs Coby, Chili Pepper, Sydney, and Elsa, and cats Tigger, and Venom. 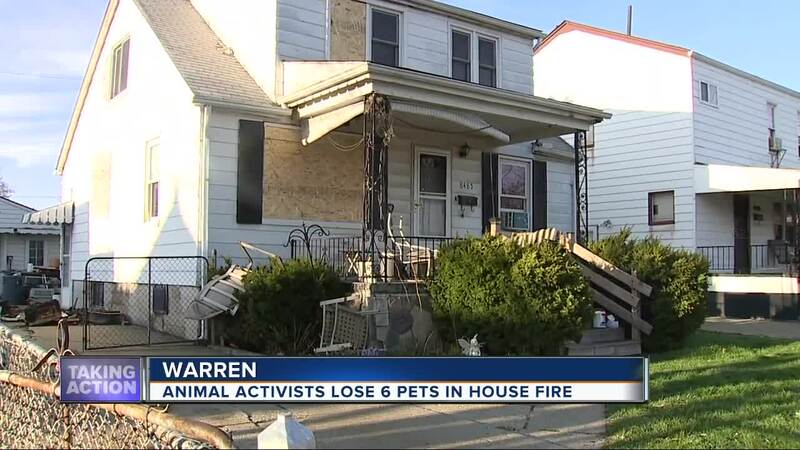 WARREN, Mich. (WXYZ) — A family in Warren is grieving the loss of six important family members; their four dogs and two cats, all rescued from area shelters. The animals died in a house fire Thursday morning on Topfer Road near East 9 Mile. “Every spot of this property has memory of them," said David Behm, the home owner. When the fire broke out, Michelle Behm could only think of dogs Coby, Chili Pepper, Sydney, and Elsa, and cats Tigger, and Venom. All of the animals died of smoke inhalation. Venom, one of the cats, was found dead Friday morning in the home. “The firefighters worked so hard. They were trying to resuscitate them when I got here," Michelle said. The Behm's are avid volunteers with I Heart Dogs Shelter in Warren, not far from their home. Three of their dogs were rescued from the shelter. Now, the shelter is stepping up to assist the Behm family, who is currently living in a motel. The shelter created a GoFundMe account in hopes of raising money for the family during this difficult time. David said despite the family's grief, they plan on rescuing other animals again one day. The cause of Thursday's fire is still under investigation.